How can Mindsonar® help you? If I asked you to imagine an X-ray machine for the mind that could actually measure how people think, what would you do with it? Well, that tool is MindSonar® and It is a web based psychological system that measures Meta Programs and Graves Drives Values. Metaprograms are the building blocks of how people think. Someone’s thinking style is made up of a combination of Meta Programs, making up a unique personal system. Graves Drives describe what they find important, their values or criteria that they measure others by or themselves by. Their Meta Programs determine their behaviour and their emotions in a given situation. MindSonar® is being used all over the world by consultants, coaches, trainers and organisational developers. The MindSonar® system helps them get to the heart of their clients thinking. Currently MindSonar® is being used in prestigious organisations like the armed forces of the Netherlands (in their leadership development course), a top European automobile manufacturer (sales), and has been used in the Olympic Dressage team (team-building), which actually won 20% of all Dutch medals in the London Olympics of 2012 and in one of Europe’s premier banks (marketing). And there have been many non-commercial applications of MindSonar® as well; it is also used in volunteer groups, day care centres and schools. 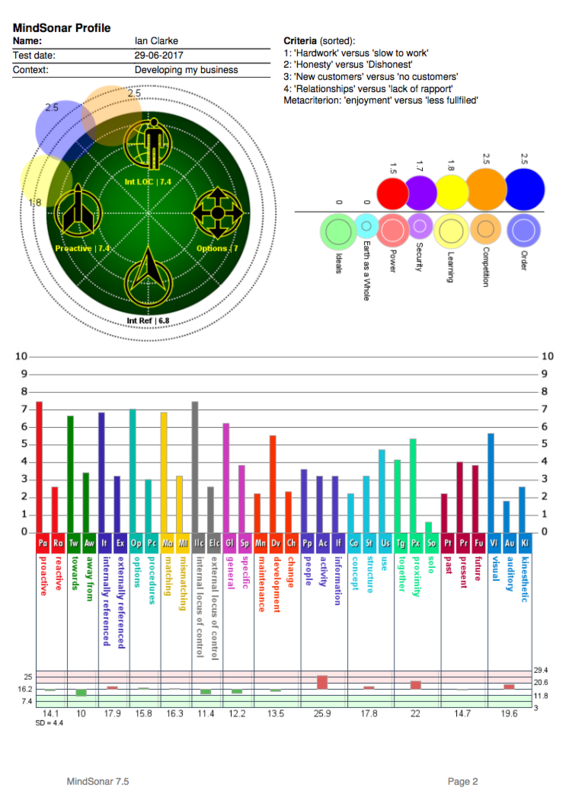 MindSonar® is not a personality test. Personality tests will tell you what you are like as a person; always and under any circumstances. Many people feel limited and ‘put in a box’ by these kinds of tests. Some personality tests will even say how ’healthy or sick’ your personality is. MindSonar® measures how you think in a specific situation. It assumes that you will think differently in different situations. MindSonar® does not assume that any thinking style is good or bad. Every thinking style has their time and place where they can be helpful. Where does the name ‘MindSonar®’ come from? The term ‘MindSonar®’ uses sonar technology as an analogy. Sonar shows us objects that cannot be seen by observing the surface of the water, and it requires an expert to understand the exact nature of those objects. What do you get from MindSonar®? A 30 page in-depth profile of how you think in a given context that makes the invisible visible. You will not find MindSonar® as a do-it-yourself test on the web. MindSonar® is offered exclusively through a network of trained and certified professionals. The combination of the measurement and the professional is much more powerful than just the measurement by itself. Motivating people more effectively by adapting the phrasing of your message. Helping people in groups and teams to understand how differences in language may hinder communication and teach them how to adapt to each other’s profiles to improve mutual acceptance and understanding. Tailoring messages to target groups Improving the reception of proposals by determining the average profile of a target group and adapting the phrasing of your proposals to that profile. Offering insights in problems and resources. Helping people understand why they get stuck in some situations and flourish in other situations, based on their profile. Analysing strengths and weaknesses of teams and organisations. Helping groups and organisations understand their strengths and weaknesses in a given context, based on the average profile and the available variety (standard deviation) in the group. Helping people and groups to develop a profile that is better suited to their present situation. Evaluating change by determining whether the (individual or average) profile has changed after an intervention and the character of that change. Changing culture, Identifying the dominant profile in a group to determine which metaprograms need to be adapted to change the culture in a desired direction. Helping teams and groups to optimally benefit from the available thinking styles, by designing an efficient sequence of interaction for a given task, based on the different profiles available. Helping teams and groups to understand the profiles necessary for a given task and helping them add (hire) new people who complement the available profiles. Helping people and groups resolve conflicts by explaining the role of different profiles in maintaining the conflict and teaching them how to speak each other’s language. Providing support by comparing trainee’s profiles with those of people functioning well in the given context and training them to develop the desired profile. Analysing the goals of a training program in terms of changes in profile. Developing training programs that are geared towards developing specific profiles. Mapping out the profile that enables certain people to accomplish extraordinary things, in order to make that capability (more) learnable for others. Establishing the average thinking style of people functioning well in a certain job and phrasing the text and design of advertisements accordingly, in order to attract people who fit the desired profile. Better selection of candidates by determining the profile that predominates among people who function well in a particular position. Selecting people who have a profile similar to the desired profile. Course fees £1250 plus vat.